Current trail conditions (during the running season) can be found in the news section of the Incline Club page. 11/8/02 Kyle Timmerman is a physician heavy into mathematics who decided to calculate running performance at Pikes Peak using ones flatland marathon time and oxygen availability at altitude. Here are the results. 9/16/02 On the 11th I posted an update to the Oil Creek Tunnel page. However it left some with more questions than answers. Therefore with a 100' tape and a camera two of us headed up to find the answer to the following question: How deep is the Oil Creek Tunnel? Not only will you get the answer you will also get 38 pictures including a picture of what we found living inside of the Oil Creek Tunnel! 9/14/02 Valerie Prothe e-mailed me the 1975 results and they have been added to the the results archives. Now only 3 years remain to complete the archives:-) Let me know if you would like to help. 9/13/02 According to my webstats one of the more popular pages off of Pikes Peak Central has been the Things done right/Things done wrong stores. Well 51 new stories about the 2002 races have been added. 9/12/02 The press archives have been updated to include the stories from the 2002 race. Sorry for the delay but I forgot to save some of them from the web so I had to type them to post them. Also for those that have been following the battle on the peak which pretty much started with this 1998 story you will love some of the letters that came out in this years version. It is almost time to start a who new section for this topic alone! 9/11/02 A few questions from some runners checking out the Oil Creek Tunnel gave me the needed incentive to update the Oil Creek Tunnel page. I love doing research on old Pikes Peak related stuff and I hope you enjoy it as well. 8/30/02 The 2002 PPM bib number list for those who I have pictures of is done. If you ran the marathon there is a good chance one of the pictures will be of you since I took over 425 photos. 8/25/02 Bill Wright sent me the link to his story on his 2002 marathon for the learn before you burn section of Pikes Peak Central. This is the 3rd year Bill has written a report and I love to read his writing. He has been rather hard on himself the last two years trying to break 5 hours in the marathon. This year he did it and got an Ascent PR along the way! 8/24/02 All stats (winners, records - 5 year, 1 year and state, doublers, streaks etc.) have been updated on the results page. 8/22/02 I have been told by the results person that he believes that the results are final so I have begun the process of updating the stats pages. 8/19/02 As you may of saw if you ran the marathon I was taking pictures near the top of he mountain. I will post a list of bib numbers for those that I took pictures of sometime next week (I hope). There are well over 400 photos! Also, until I hear that the results linked to below are final results I will not be updating any of the stats pages. 8/18/02 The Pikes Peak Marathon took place today. Here are the results. 8/17/02 The Pikes Peak Ascent took place today. Here are the results. 6/15/02 Got another call from the Forest Service today. It was confirmed to me that all three races (BTMR, PPA & PPM) are scheduled to happen as planned:-) The Forest Service is working hard to make this happen! 6/14/02 Three more medals were added to the Pikes Peak Medal collection page. 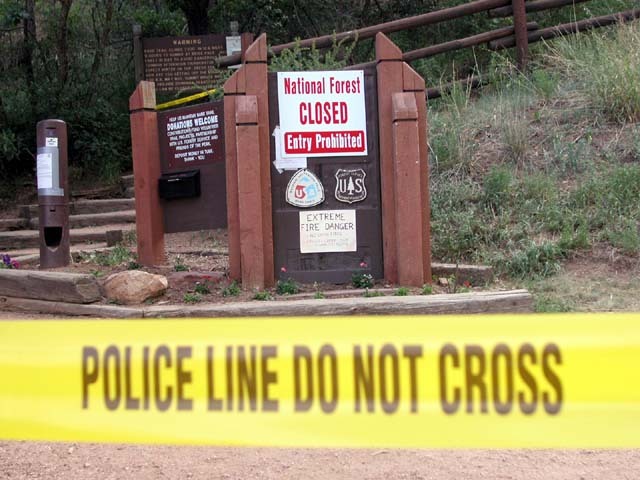 6/10/02 The Barr Trail is closed! The Pike National Forest as well as the Barr Trail are closed due to the fire situation. There is no information as to how long this closure will last. You can get tons of info at the Forest Services Hayman Fire page. Click on news releases for information on the closures. Please do not write and ask me how this will affect any of the races on Pikes Peak  I simply do not know! 5/17/02 Registration for the 3rd annual Barr Trail Mountain Race presented by Pikes Peak National Bank is underway. The race starts at the COG depot and runs to Barr Camp and back. It makes for a great race and a super tune-up for those getting ready for the Pikes Peak Ascent and Marathon held 5 weeks later. 4/18/02 If you ran in the 2001 Pikes Peak Ascent or Marathon there is a 100% chance you were behind someone running in one of those shirts. If you went to the awards ceremony you saw them all over the place, including 10 top 10s! One PPMer was overheard to say, I just spent several hours going in and out of T-shirt shops looking for that shirt and never did find it! While you wont find them in any store, for a limited time you can get them here! 4/4/02 Ron Ilgen, TCR president and PPM race director, has indicated that they will add the aid station at Bobs Road:-) You can see Rons letter in the Incline Clubs April 4th, newsletter. 3/27/02 At the March 24th, Incline Club long run a survey was taken about the need for an additional aid station in the Pikes Peak Ascent and Marathon at Bobs Road and those results were given to the respective race directors. You can read a copy of the letter in the Incline Clubs March 29th, newsletter. While dropping the letter off I learned that both waves of the Ascent are now full. 2/26/02 My webstats program tells me that 100s of people have spent a ton of time trying to solve the Pikes Peak Challenge game. Today Dave Clark became only the 2nd person to finish it correctly! Way to go Dave:-) He says he wrote a program to help him solve it!!! 2/25/02 It turns out that when I split this file into two files for the 2001 and 2002 seasons I forgot to upload them. Sorry about that! You will see on the 14th a new website was announced for the Incline Club  the club that has taken home 27 top 10 places at the peak races in the last 3 years alone! 2/6/02 Found another Pikes Peak Cam with a view from Griffis Blessings downtown office. 1/3/02 Gary Cehelsky sent in his 2001 marathon story to be posted in the first person race accounts section. This story proves that you should be careful how you treat people even when you meet them in the middle of the woods and they are from another state. Gary had quite a bit to say about the people he ran into during his 2-week stay at Barr Camp. I am honored and humbled by what he wrote about me. During that time Gary also did a lot of training for his race. He improved his marathon time by about 50 minutes with over 40 of them being shaved off his ascent time. Like a lot of competitive people he was hoping for more. 1/3/02 A couple of people wrote that the scan of the 1968 Gazette Tellegraph story on the Pikes Peak Marathon medal was too hard to read. Therefore I typed in the article and that should take care of that.